Today’s letter goes to a lovely lady who unselfishly sends hand written letters but rarely receives them (Attention Judy’s Family + Friends: Shame on you, pick up your pens!). I so appreciate the world’s letter-writers and decided it was time for Ms. Judy’s mailbox to get something other than bills. I commend your efforts—letter writing is a wonderful art. And I can’t help but celebrate those who share my penchant for paper! I am certain your friends treasure your correspondence even if they don’t always write back. In the days of email and 140 character messages, I think a lot of people have forgotten how to pen a proper note. It’s nice to know there are devotees out there, keeping the tradition alive. I recently discovered a great collection of love letters you may like, “Other People’s Love Letters: 150 Letters You Were Never Meant to See.” I mean the title alone has you at hello, no? It’s good stuff. Perhaps it will inspire your next letter to the one you love? Thanks for writing (and for reading). 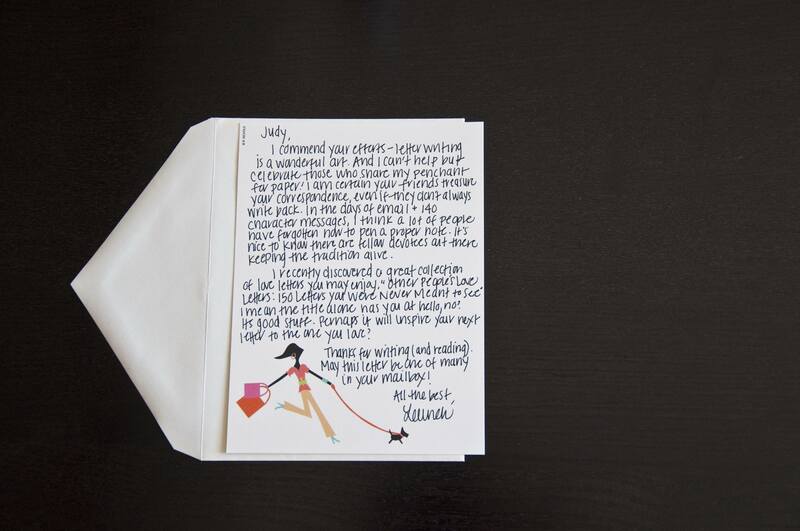 May this letter be one of many in your mailbox!